On Monday 21st March 1960, two days after the Pan Africanist Congress (PAC) a spinoff group of the African National Congress (ANC) announced that it would commence its own nationwide Anti Pass Campaign in their Johannesburg Conference, members of the PAC intentionally left their reference books (passes) at home, so that the South African police would be able to imprison them for not bringing their passes while going into the white urban areas. The PAC argued that by not bringing their passes, which restricted the movement of native South African, the police would be able to arrest the PAC protestors and thus a strike would result with drastic effects on the economy. They also stated that if the South African police did not arrest them, the anti pass campaign would be successful and that the government would be coerced in to changing it's pass laws. Also support for the South African government by the pro-white Afrikaners would wane as a result of the government's action in not regulating their pass laws. However what resulted from the PAC nationwide anti-pass campaign could not be expected. In the South African town of Sharpeville, PAC members aroused local native citizens into joining the anti-pass march. Other PAC members sought to create a nationwide strike by stopping bus drivers from going on duty and by intimidating indigenous Africans in to not going to work. In the early hours of the 21st, PAC members and other sympathisers of the cause marched on to the local Sharpeville police station to be gaoled. The protestors found a contingent of police officers armed with live ammunition lined up outside the police station. When the campaigners appealed to be caught, the white police commander denied them access, however about 11 o'clock they were admitted in to the police station. At about 1:15 pm a small scuffle began near the entrance of the police station and a policeman was accidentally pushed over. A police member on top of an armoured car panicked and opened fire on the crowd. Soon after other police officers joined in. These acts of shooting caused the crowd to disperse and resulted in 69 deaths and 180 people becoming seriously injured. In a press conference the leader of the PAC, Mr Robert Subokwe stated that the anti-pass campaign should be non-violent. ﻿"African people have entrusted their whole future to us. And we have sworn that we are leading them, not to death, but to life abundant. My instructions, therefore, are that our people must be taught now and continuously that in this campaign we are going to observe absolute non-violence." The anti-pass campaign, which started as a peaceful non-violent movement led to many controversial effects such as the creation of Poqo and the Umkhonto weSizwe (MK), the armed wing of the PAC and the ANC. Although the Sharpeville massacre led to the imprisonment of many anti-apartheid leaders and the implementation of the Unlawful Organisations Act NO 34, which outlawed the PAC and the ANC. The Sharpeville massacre aroused outrage against the South African government and worldwide support, awareness and sympathy for the anti-apartheid activism in South Africa increased. Dismayed by the actions of the South African government, many countries boycotted the importation of South African goods and labour organisations refused to service South African cargoes. The UN also conducted investigations in to the South African governments legislations and actions in response to the massacre. "We are grateful that our state department has protected the mass killings of our South African brothers and we are pleased that the UN security council will meet March 29th to consider that outrage." "The O’Malley Archives." 1960. N.p., n.d. Web. 27 May 2014. <http://www.nelsonmandela.org/omalley/index.php/site/q/03lv01538/04lv01539/05lv01551/06lv01552.htm>. "To Dwight D. Eisenhower." To Dwight D. Eisenhower. N.p., n.d. Web. 29 May 2014. <http://mlk-kpp01.stanford.edu/index.php/encyclopedia/documentsentry/to_dwight_d_eisenhower2/>. "Sharpeville massacre." Wikipedia. Wikimedia Foundation, 26 May 2014. Web. 27 May 2014. <http://en.wikipedia.org/wiki/Sharpeville_massacre>. "Sharpeville Massacre, 21 March 1960 | South African History Online." 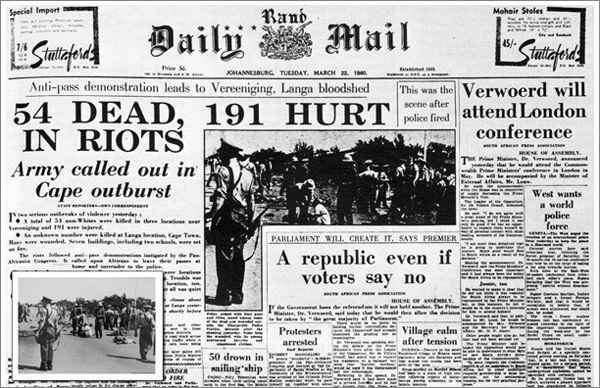 Sharpeville Massacre, 21 March 1960 | South African History Online. N.p., n.d. Web. 27 May 2014. 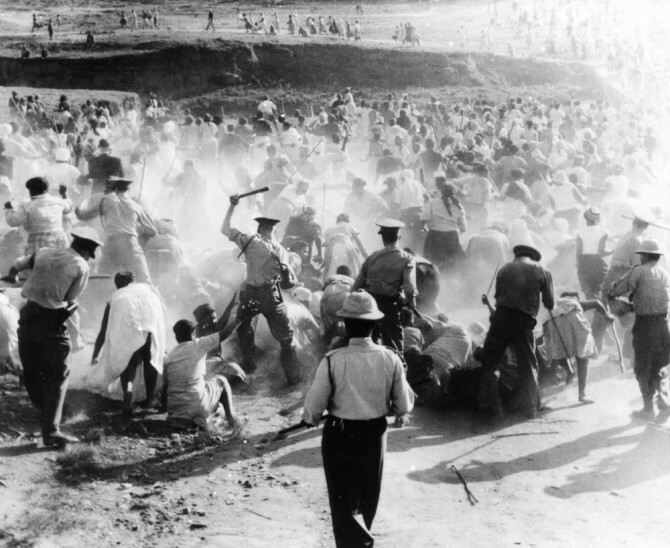 <http://www.sahistory.org.za/topic/sharpeville-massacre-21-march-1960>. 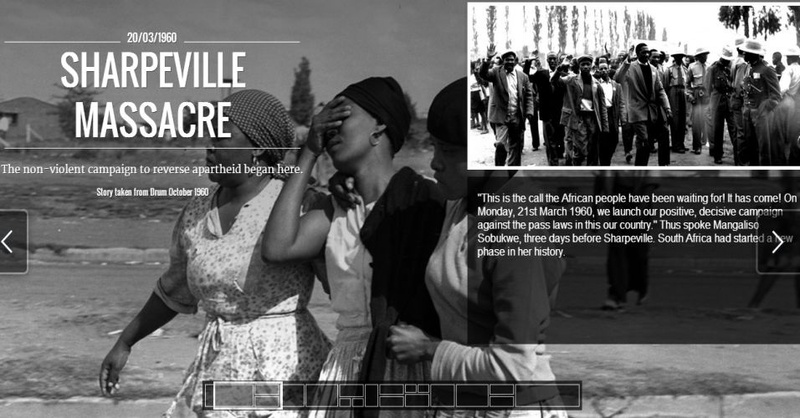 "Sharpeville Massacre - 21 March 1960 | The ANC Archives." The ANC Archives. N.p., n.d. Web. 29 May 2014. <http://ancarchives.org.za/sharpeville-protest/>.